Raumfahrt+Astronomie-Blog von CENAP - Blog: Astronomie - Are self-replicating extraterrestrial spy probes eating each other? Modelling suggests that von Neumann machines probably aren’t a thing. Lauren Fuge reports. Alien-built probes could saturate the galaxy in as little as 10 million years, but they don't appear to have done so. In case you were wondering, cannibalistic space probes are probably not the reason we haven’t seen aliens yet, according to a UK researcher. In a paper slated for publication in the International Journal of Astrobiology, and available in the pre-print libraryarxiv, computational astrophysicist Duncan Forgan explores one possible solution to a question that challenges our beliefs about humanity and our place in the universe – where is everyone? People stargazing on a dark night sometimes idly mull over this question. Countless exoplanets spin around other stars, so it isn’t far-fetched to assume life – in particular, intelligent life – must have arisen on at least some of these worlds. A fraction of these lifeforms should have developed the advanced technology to send out interstellar spacecraft, and although travelling such vast distances across space would take a long time, the universe has been around for billions of years – so why haven’t we seen any trace of aliens yet? This question is known as the Fermi Paradox, named for the Italian-American physicist who approached the problem with some mathematical rigour in 1950. The paradox is strengthened when considering the possibility of exploring the galaxy using self-replicating probes – also known as von Neumann machines, after the mathematician who proposed the technology in the 1960s. 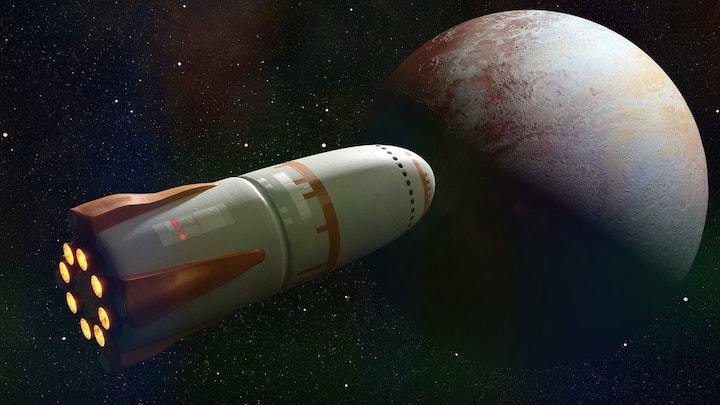 An advanced civilisation could launch a single probe with the capability to mine raw materials from other planets and asteroids in order to build a replica of itself. The probe and replica would then travel onwards to different solar systems to duplicate themselves again, and by repeating this process their population would grow exponentially. In a relatively short space of time – perhaps as little as 10 million years – the galaxy would be teeming with these exploratory machines. And yet, in line with Fermi, we haven’t spotted one mining nearby asteroids for metal or setting up a cloning workshop on the moon. Over the years, scientists have proposed a host of potential reasons to explain this. Maybe the probe is still en route, or is purposefully keeping itself hidden, or we just aren’t looking for the right signs. Maybe the Earth is indeed unique in hosting life, or intelligent civilisations are doomed to destroy themselves before achieving interstellar travel. Or perhaps civilisations refrain from building self-replicating probes because of the potential risks involved. One potential consequence, called the predator-prey hypothesis, involves some probes “evolving” into predators that cannibalise other probes as an efficient way to make copies. “This would reduce the total population of probes, ensuring that humanity would not see them,” says Forgan. The population dynamics of such a situation have largely been unstudied, and so Forgan set out to use predator-prey models from mathematical biology to explore whether this hypothesis is a likely answer to the Fermi Paradox. Forgan used the Lotka-Volterra equations: a pair of first-order differential equations classically used to describe the interactions of two species with a predator-prey dynamic, in particular how the populations fluctuate over time. Forgan applied the equations to hypothetical self-replicating probes across an interstellar network. “In the network, each star plays host to a predator-prey population, which transmits and receives both predator and prey from neighbouring star systems,” he explains. Typically, the solutions to the Lotka-Volterra equations oscillate – sometimes the predators outnumber the prey, and sometimes vice versa. In this case, Forgan ended up with just such an oscillatory solution. “Depending on the local growth mode of both populations and the flow of predators and prey between stars, there are many stable solutions with relatively large numbers of prey probes inhabiting the Milky Way,” Forgan says. This means the predator-prey hypothesis doesn’t significantly reduce the total population of probes, suggesting that there could still be heaps out there. The Lotka-Volterra model therefore doesn’t actually provide any convincing solutions to Fermi’s question. Lewis Mitchell, a mathematician at the University of Adelaide in Australia, says that although the paper is interesting and adventurous, he’s unsure whether the concepts will ever be experimentally testable. “With complex models like this one, particularly where you have lots of parameters which can be tuned, it becomes possible to produce almost any kinds of behaviour,” he explains. Such models could produce solutions to the Fermi Paradox, non-solutions to the Fermi Paradox, and almost anything in between – and to test which one is correct, we would need to constrain those parameters or experimentally test the models’ predictions. Typically, the Lotka-Volterra equations take into account four factors: the growth rate of prey, the rate at which predators destroy prey, the death rate of predators, and the rate at which predator populations increase by consuming prey. In predator-prey systems on Earth, mathematicians generally have a pretty good idea of these numbers from observations, but for hypothetical systems of spacecraft the parameters are simply wild estimates. “Unfortunately, the parameters in Forgan’s model are unlikely to be ever measurable experimentally,” Mitchell says. “Short of observing some interstellar conflicts between alien craft, we probably won’t be testing any predictions it might make any time soon either. Forgan also makes a variety of other assumptions in his analysis, including the initial premise that assumes probes would mutate in the first place. Surely, a civilisation advanced enough to build such technology would put safeguards in place to protect the spacecrafts from random errors, even over long timescales. But nonetheless, the paper presents an intriguing thought experiment. Negative results are an important facet of science – by ruling out potential solutions to the Fermi Paradox, we step incrementally closer to the real answer.